The Cisco 9971 Unified IP Phone is an executive class collaboration endpoint that provides voice, video, applications and accessories. 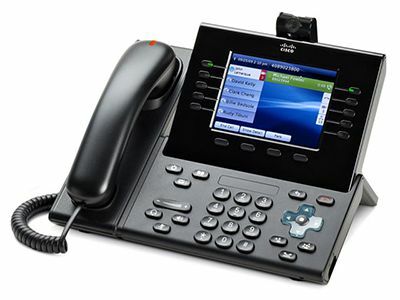 Cisco 9971 IP Phone highlights include Gigabit Ethernet, Wideband Audio, Color Touchscreen Display, desktop Wi-Fi connectivity along with a new industrial design and user interface designed for simplicity and high usability. Cisco 9971 IP Phone accessories, sold separately, include a standard definition USB camera, Jawbone ICON for Cisco Bluetooth headset, color Key Expansion Module plus support for Bluetooth, USB, Secure Digital Input Output (SDIO) devices. Application support includes XML, Java Midlet and Browser capabilities. Ergonomic Design: Highly usable and intuitive arrangement of lines, features and calls. Transfer, Conference and Hold appear on hard keys to reduce the number of presented softkeys to a maximum of 4 per call state. Display: VGA presentation for calling, video calling and applications. 5.6-inch graphical TFT color display, 24-bit color depth, 640 x 480 effective pixel resolution, with backlight. Display also supports localization requiring double-byte Unicode encoding for fonts. Ethernet: Choice of 802.11 a/b/g desktop wi-fi connectivity or Gigabit Ethernet network connectivity and switch port available for a downstream PC. System administrator can designate separate VLANs (802.1Q) for the PC and phone, providing improved security and reliability of voice and data traffic. Bluetooth: Mobility for headset users within 30 feet of their desktop to enable the freedom to go to the printer, a colleague's desk or nearby private location while on a call. The IP Phone 9971 supports the Hands-free and Headset Bluetooth profiles including support of the Jawbone ICON for Cisco Bluetooth Headset. USB: 2 USB ports accelerate the usability of call handling and applications by enabling accessories such as the Cisco Unified Video Camera, wired and wireless headsets. External Audio Ports: General Purpose Audio In and Audio Out ports enable a relaxed speakerphone experience over external speakers and microphone. Cisco Unified Video Camera: Available separately, enables 2-way video calling between phones or to a media conference unit.